How to assemble fellow time patrollers. Making your way around Dragon Ball Xenoverse's Toki Toki City can be a little confusing for newcomers. Well, not really. There are only three areas-- but figuring out how to get into a nice round of cooperative face-punching, and more importantly, getting credit for it, is a little enigmatic. We're here to help. How many players can play Dragon Ball Xenoverse locally (couch co-op)? How many players can play Dragon Ball Xenoverse via system link or LAN? How many players can play Dragon Ball Xenoverse online? How do you begin a co-op session in Dragon Ball Xenoverse? 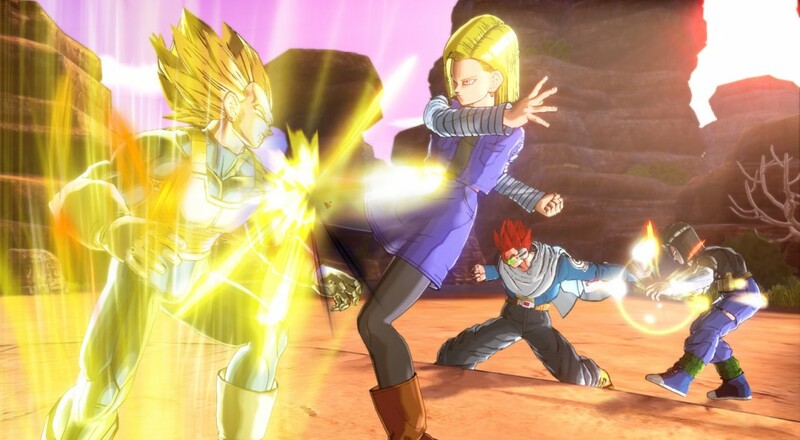 How does save game progress work for co-op play in Dragon Ball Xenoverse? Can I join a game if the host is further along than me in Dragon Ball Xenoverse? What does the Dragon Ball Xenoverse season pass get you? Are the cooperative Parallel quests the same missions as the single player campaign? How many co-op Parallel Quests are in the core game? What kind of rewards are offered through the Parallel Quests? None, but there is a local two player VS mode. After a few tutorial missions players will have access to "Online Parallel Quests" from the hub world. These are the co-op missions. Players can either join a lobby for random matchmaking, invite friends, or play these quests offline with AI partners. Parallel Quests are unlocked by progressing through the single player campaign. Initially, only the host player will be ranked upon completing the Parallel Quest. After a player has hosted a quest they can replay it as a guest in another player's hosted games, earning higher ranks and more rewards. Any player can join and play in a Parallel Quest they haven't unlocked yet, but they will not receive a rank until they have met the criteria to unlock it and hosted the quest themselves. Parallel Quests are usually unlocked through completing quests in the separate single player mode. Here's a little tip: You don't have to win your initial battle when you initially host a newly unlocked Parallel Quest. You can even host the offline version with bots. Upon completion, win or lose, you can jump into any of your friends' or random players' hosted quests and be properly rewarded. Yes, but you won't receive a rank. No, these are separate missions. They offer different "what-if" scenarios from standard Dragon Ball lore. There are 55 co-op Parallel Quests. Players will earn a rank and random drops. Each quest must be played multiple times to earn all the potential rewards. Players will earn stat-boosting gear, cosmetic upgrades, and a wide variety of super moves and ultimate finishers for their created character. Feel free to ask us more questions and we'll update the FAQ. Page created in 1.2384 seconds.